Outstanding bassist, he has played in many great bands. He also led a fantastic project called Camelo Pardalis, reuniting the cream of British musicians in the 70s. Steve York was born on April 24, 1948, in London, England. He started playing in bands around 1964, some "punk blues" bands. After Graham Bond, Steve played for two years in variety & Top 40 bands, touring Turkey & Crete, in US air bases. 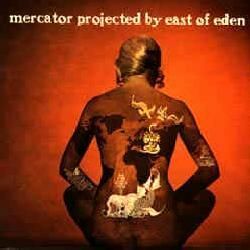 They released a superb debut album, Mercator projected. After that, Dave Dufort left in February 1969. At least, two compilations have been released by the band. In 1971, a compilation was released, Jig-a-jig, comprising tracks from their 1st and 2nd album. Another one was World of East of Eden. But, soon after, in March 1969, Steve York also left. Steve York and Jon played together again two years later in the band Dada. Manfred Mann Chapter Three - from left to right: Steve York, Manfred Mann and ? They recorded a commercial TV jingle for Michelin, along with about 50 other jingles. 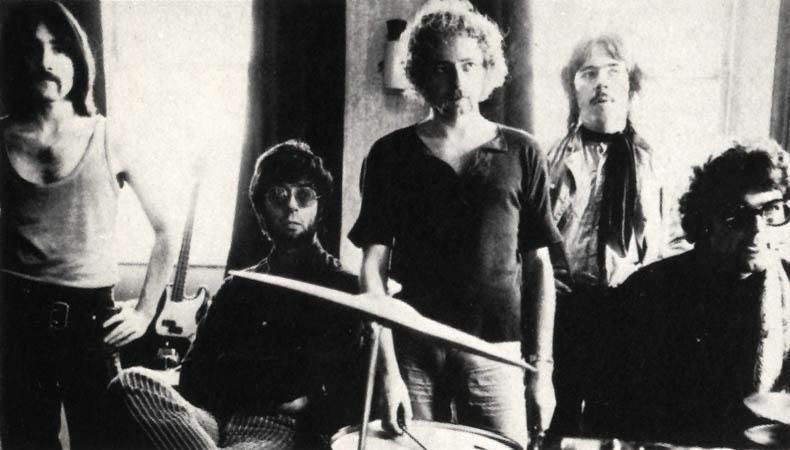 In June 1969, Manfred Mann (the band) disbanded, so Mann and Hugg were free to develop their project full time. So, Emanon turned into Manfred Mann Chapter Three. They made their first appearance in October 1969 using this new band name. 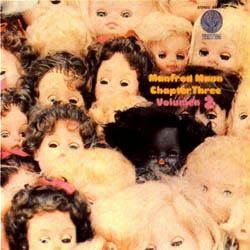 They released a first album, Manfred Mann Chapter Three, that sadly didn't sell, although it got a 5 star review in US Downbeat Magazine. The album also featured contributions by famed arranger, the late Derek Wadsworth. 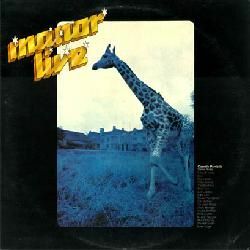 The horn players in the album were Sonny Corbett (trumpet), Harold Beckett (trumpet), Ian Fenby (harmonica), Phil Kenzie (sax), Chris Pyne (trombone), Dave Quincy (sax, from the band If). With fantastic guest vocalists, the lovely ones Madeline Bell, Sue Glover and Sunny Leslie. Steve York performs a bass solo in the song ´Snakeskin garter´. The album has been reissued on CD with 4 bonus tracks. They started recording their 2nd album, Manfred Mann Chapter Three Volume Two, but Craig Collinge left them during the sessions. They used two great session drummers, Conrad Isidore and Andrew McCulloch. The horn players on it are: Sonny Corbett, Dave Coxhill, Dave Brooks (sax), Clive Stevens (sax), Harold Beckett (trumpet). Also appearing Jerry Field on violin. The music in the album is very dense, with fantastic moments, where Steve York work on bass is outstanding. Manfred Mann Chapter Three toured extensively promoting the album, even in the States, where they shared bill with Jefferson Airplane at the Fillmore East in May 1970. Also 3 days at Fillmore West with Boz Scaggs, Steve Miller and Janis Joplin. By that time, the lineup in Manfred Mann Chapter Three had changed, as Bernie Living had already left. For their next concerts in England, they augmented the lineup with a fantastic section of vocalists. They started recording a 3rd album with help from session drummer Chris Slade, but poor sales and disappointment led Manfred Mann to finally split the band, sending the album to a shelf, where it still remains. This was around December 1970. Dada was a famous band among avant-garde circuits, having released an album for Atlantic Records. 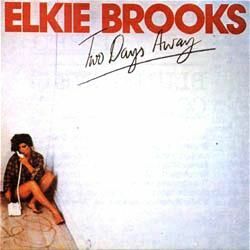 It was fronted by lead singers Elkie Brooks and Robert Palmer, with guitarist Pete Gage. Steve York auditioned for the band in 1971, replacing Phil Chen. They toured the States, playing at the Fillmore East and Carnegie Hall. Ahmet Ertegun flew to London and saw them at Ronnie Scott's Club. By request of Ertegun, they evolved into Vinegar Joe. After the idea for transforming Dada into a new band was accepted, Brooks, Palmer, Gage and York started looking for a keyboardist and drummer. First choice was Mitch Mitchell, from Jimi Hendrix Experience, but they finally went into the studio with two drummers and keyboard players because they didn't find regular players. Rob Tait joined the band during the recording of their first album, Vinegar Joe. Keef Hartley had done all the sessions until they found a permanent drummer, except one track, ´Live A Little Get Somewhere´. Rob then did this track in Island Studios and went on the road with the band. Other musicians appearing in the album: John Hawken and Tim Hinkley (keyboards), Dave Brooks (sax), Conrad Isadore (drums), Gaspar Lawal (percussion), and from Average White Band: Malcolm ´Molly´ Duncan and Roger Ball. While the band was waiting for the album to be released, Steve York left the band for a year. Climax was a band formed in LA by singer Sonny Geraci in 1971. They had a big hit in US charts in 1972 with the song ´Precious and few´ and a self-titled album, Climax. Recorded by Geraci and Walter Nims with session players, they assembled a live band for promoting it. Steve joined them for tours and TV appearances during nine months. 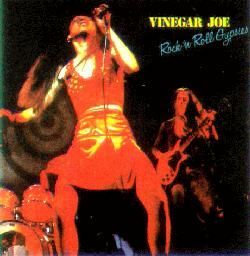 While Geraci kept using the band name, Steve York came back to England after one year, to rejoin Vinegar Joe. 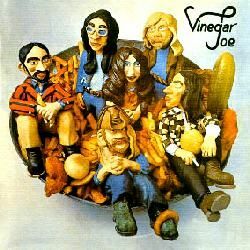 Vinegar Joe - from left to right: Elkie Brooks, Robert Palmer, Pete Gage, Steve York and ? Pete Gavin, who came from mighty band Head Hands & Feet, still had some commitments so Keef Hartley recorded the album, Rock´n´roll gypsies, as a session drummer. The album contains a fantastic, beautiful rendition of Jimi Hendrix's ´Angel´. They toured the US with Jim Mullen. But Mullen abandoned the band in April 1973. 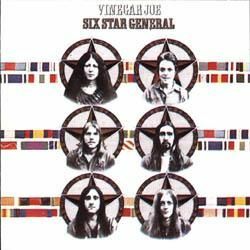 They release a 3rd album, Six star general, with tracks featuring John Woods. Sadly, there were problems with the manufacturing of the album, apparently due to the ´vinyl crisis´. The album was sold out in the first two weeks of release, but Island didn't press any more. But, after three albums and a tour around USA, Robert Palmer left to pursue a successful solo career, and the band finally dissolved. While in Vinegar Joe, Steve York started working in his own project, baptized Camelo Pardalis. More details below for the album released. After a while, Steve left (being replaced by Tom Duffy). They were usually joined by Diane Stewart and/or Phil Bailey on percussion for many gigs. Keith Bailey, Ginger Baker, Keith Baker, Graham Bond, Pete Brown, Jack Bruce, Roger Bunn, Tom Duffy, Mike Falana, Derek Foley, Steve Gregory, DeLisle Harper, Jon Hiseman, Brian Holloway, Dave Howard, Gaspar Lawal, Jon Lee, Philamore Lincoln, Peter MacBeth, Mamood, John McLaughlin, John Morshead, Paul Olsen, Carolanne Pegg, Terry Poole,... up to 36 musicians. The lineup was augmented sometimes by the great, late Vincent Crane on keyboards, as well by some other different musicians along the years. Can someone provide more info? Dave Ambrose, Pete Bailey, Paul Brett, Arthur Brown, Chris Bryant, Mark Brzezicki, Chris Burrows, Charley Charles, Barry Clarke, Tony Crane, Vincent Crane, Phil Curtis, Jeff Cutler, Andy Dalby, Jeff Danford, Billy Davidson, Lyn Dobson, Eddie Edwards, Bob Ellwood, Des Fisher, Max Gest, Nick Greenwood, Derek Griffiths, Nina Gromniak, Goodge Harris,... up to 51 musicians. But, after a rehearsal period, they finally split, and Ariel/Luther went to form a new band, Widowmaker. Dave Brooks also played sax sometimes. A double album was released in November 1976 from those 3 concerts, called A poke in the eye (with a sharp stick). A film was also aired, called Pleasure at Her Majesty´s, but I don´t know if the Goodies segment appears there. Has anybody seen it? Does anybody know the name of Mike, the keyboardist? They recorded the fantastic album Two days away, with Leiber & Stoller (Steve co-wrote one song with them). Other fantastic guest in the album was Jean Roussel (keyboards). The album was followed by a British tour during 1977, as well as TV appearances in Germany (usually at Musikladen program - I have two of their appearances!) and France. The songs ´Pearl´s a singer´ and ´Sunshine after the rain´ were hits in the UK, as well as provided top five singles in Europe. Rosa Avila, Brian Badhams, Pete Baron, Elkie Brooks, Mike Cahen, Simon Carter, Jimmy Chambers, Zal Cleminson, Gerry Conway, Tom Dostel, Melvyn Duffy, Paul Dunne, Johnny Dyke, Brandon Fownes, Arnaud Frank, Ken Freeman, Pete Gage, John Giblin, Steve Gregory, Isaac Guillory, Martin Harryman, Tim Hinkley, Al Hodge, Gary Hutchins, Roger Inniss,... up to 51 musicians. This was the core band. Adrian Legg joined later. They played every Sunday night for about 6 years at the Hare & Hounds pub in Upper St. Islington, London, plus other gigs around London. George Khan and Dino Coccia also played with the band a couple of times. Davie Craig was also a member, but don´t know when this happened. After that, Steve joined Chicken Shack, as we're going to read. But he came back to work on Marianne's next album. More later. They even played in Madrid, Spain! Miller Anderson, Tony Ashton, Dave Bidwell, Louis Borenius, Geoff Britton, Paul Butler, Bob Clouder, Jan Connolly, Bob Daisley, Gary Davies, Ross Elder, John Glascock, John Gunzell, Paul Hancox, Keef Hartley, Alan Hull, Mick Jones, Ray Knott, Jim Kroeven, Ric Lee, Paul Martinez, Christine McVie, James Morgan, Alan Morley, Alan Powell,... up to 40 musicians. MARTHA & THE VANDELLAS #? Leo Abrahams, Martyn Barker, Johnny Boyle, Roger Bunn, Rob Burger, Greg Cohen, David Coulter, Dr John, Mark Egan, Roger Eno, Marianne Faithfull, Bill Frisell, Garth Hudson, Gary John Kane, J T Lewis, Jon Mark, Joe Mavety, Andy May, Rory McFarlane, Brian McFee, Daniel Mintseris, Glenn Patscha, Jack Pinter, Marc Ribot, Eddie Rodriguez,... up to 36 musicians. RED BEANS & RICE #? Steve York played with them approximately around 1980. In October 1981, Steve left England and moved to New York, playing mostly session work. Steve stayed touring with Laura until 1985, also playing in TV appearances, such as Solid Gold (3 times) and Johnny Carson´s Tonight Show (twice), although he sadly doesn't appear in any of her studio albums. David Barard, Eleanor Barooshian, Ronnie Barron, Graham Bond, Alonzo Bowens, Bobby Broom, Richard Brunton, James Calhoun, Richard Crooks, Ronnie Cuber, Dr John, Herman Ernest, Buzzy Feiten, John Fohl, Richie Fontana, Steve Gadd, Sydney George, Doug Hastings, Karl Himmel, Kim Hutchcroft, Jeanette Jacobs, Joyce Kaye, Ken Klimak, Tammy Lann, Neil Larsen,... up to 34 musicians. After that, Steve moved again, this time to Minneapolis. In 1986, they released a self-titled album, Hoopsnakes, with help from Beverly Demps on backing vocals. Soon after, Steve quit and managed the band. But in 1988, he came back, starting a tour around Norway. He stayed until 1992. Steve did this once a year from 1989 to 2001, whenever Bo played in Minnesota. Apart as working as a band promoter, he usually plays bass and acts as musical director for bands such as The Platters, Drifters, Coasters, the Ink Spots, Fabian, The Marvelettes or The Shirelles, when they play near Minneapolis. York played piano for most of these shows. Steve York played on Percy Strother´s album A good woman is hard to find, along with his wife Lisa York (nee Lisa Krieger). Percy and Steve also toured Belgiun & Holland in 1992, using Dutch musicians (such as Jan Mittendorp on guitar). Steve stayed one year with Percy. HUDSON AND THE HOO DOO CATS #? BIG JOHN DICKERSON BAND #? + maybe others unknown to me. Help, please! Other members that played with them are Martin Montenegro on sax and Memo Suarez on drums. The album, Manor live was one of the first releases by (then) brand new label Virgin. Exactly, it was the 3rd album released by the label, after Mike Oldfield's Tubular bells and Gong's Radio gnome invisible: part one - the flying teapot. No live gigs were ever made to promote the album. Way too many people! Comments: This was a megaband assembled by Steve York. The list of musicians is fantastic, including most of Steve´s bandmates. Comments: A great artist and performer. Born Mac Rebennack, he has always had the respect of the musicians. This album includes guest collaborations from the complete Eric Clapton band these days, Derek & The Dominos: Eric Clapton (guitar), the late Carl Radle (bass), Bobby Whitlock (keyboards) and Jim Gordon (drums). Plus Mick Jagger (vocals), Graham Bond (sax), Ronnie Barron (keyboards), Steve York (bass), Jesse Boyce (bass), Victor Brox (keyboards), Calvin 'Fuzzy' Samuels (bass), Wayne Jackson (horns), Chris Mercer (sax), Jerome Jumonville (sax), Bobby Keys (sax), etc. Backing vocals by Doris Troy, P.P. Arnold and Shirley Goodman. Comments: He's the famous singer and showman of the Crazy World of Arthur Brown (the one from 'Fire' fame). Gladly, he's still around... 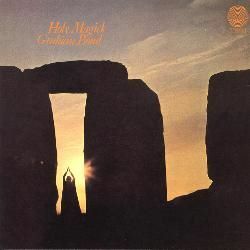 This album from 1974 features some of his old bandmates, such as drummer Drachen Teaker, plus Andy Dalby (guitar), Steve York (bass), George Khan (sax), Pete Solley (keyboards), Keith Tippett (keyboards), Charlie Charles (drums), Charles Dunbar (drums), and backing vocals by Stevie Lange and Mutt Lange, among others. The album was also reissued on CD with Chisholm in my bosom under the stamp ´2 albums on one CD´. Comments: Most of the tracks are featured in the CD compilation The art of bottleneck / slide guitar. Comments: Great album by this fantastic singer. With some of his old mates in Vinegar Joe: Pete Gage (guitar), Steve York (bass), plus Isaac Guillory (guitar), Jean Roussel (keyboards), Ronnie Eades (sax), Trevor Morais (drums), Morris Pert (percussion), and backing vocals by Marcy Levy, Carla Benson, Jimmy Chambers, George Chandler. It was reissued on CD as a twofer with Pearls. Comments: Live VHS video and laserdisc recorded in Lake Tahoe in 1984. Comments: Compilation comprising most of the album Bottleneck / slide guitar (minus 1 track), plus 5 additional tracks from Follow you down. Comments: The A side is a parody of ´Pearl´s a singer´ in which Steve York also played. Comments: In April 1976, a series of benefit concerts on behalf of Amnesty International were held at Her Majesty´s Theatre in London. Appearing there: Monty Python, The Goodies, Beyond The Fringe and others. A live album was released in November 1976 from those 3 concerts. A film was also aired, called Pleasure at Her Majesty´s. It was finally reissued as 2CD in 1992, with 3 additional Goodies songs. Comments: Female singer, she has also used other names such as Wanda Arletti. Comments: Instructional album, it originally included a book. CD reissue has a different album cover. 01. I think Steve plays in this recording by The Goodies: Yum! Yum. Can someone provide some info, please? 02. Can someone give additional info about Giant Marrowfat, please? 03. Steve played in an album by Carl Groszman, along with Ringo Starr? Does anybody know the album title? 04. Steve York played in a single by Harpo Squeaks, but don´t know which one. Does anybody know? Disclaimer: I don´t own or upload any of the videos linked here. I just include links to live videos that are already available, in order to show the work of this musician. Anyway, if someone feels that some link shouldn't be included, please write me at the email address shown below. And if you know of more videos featuring Steve York, please, also write me with the link. Featuring: Elkie Brooks, Pete Gage, Robert Palmer, Steve York. Rest of the band unknown to me. Featuring: Elkie Brooks, Mike Deacon, Pete Gage, Robert Palmer, Alan Powell, Steve York. Featuring: Elkie Brooks, Pete Gage, Tim Hinkley, Trevor Morais, Steve York. Featuring: Elkie Brooks, Pete Gage, Tim Hinkley, Trevor Morais, Steve York. Percussionist (Arnaud Frank?) unknown to me. Featuring: Elkie Brooks, Pete Gage, Tim Hinkley, Trevor Morais, Steve York. Rest of the band unknown to me. Featuring: Terry Ayres, Brian Becvar, Jim Behringer, Laura Branigan, Carlos Casarez, Richie Fontana, Danny Hamilton, Virgil Weber, Steve York. Featuring: Laura Branigan, Steve York. Rest of the band unknown to me. Featuring: Big Joe Dickerson, Donald Robertson, Lisa York, Steve York. Guitarist unknown to me. Steve York: for being so polite and such great musician and person. Gary Moberley: for info on the Red Beans & Rice single. Blake Powell: for forwarding my info to Gary Moberley, as well as for magnificent presents. Cal Batchelor: for allowing to get a copy of his unreleased album with Steve York. Tim Hinkley: for contacting via Steve York, as well as many info. Joe Locker: for info on Alive & Picking (2007). Gerry Field: for info on him playing in a session for Manfred Mann Chapter Three (2007). Alex Gitlin: for lots of help with scans, albums, info, etc. John H Warburg: for lots of biographical infos on East Of Eden members (2006). 22/February/2011 - Page added to the blog. 18/October/2000 - Original page written by me (in the old site).